N.B. There are no spoilers ahead about Mad Men, at least direct ones. Also, this is just an idea, one which I am working on slowly. Nothing here is perfected, either concepts or execution. In this scene, Ken is perhaps a stand-in for Matthew Weiner and Sal a stand-in for the general public, who feel a lack of understanding and see a feel of accessibility to be a form of trauma (Rhetorica in Motion, 74). Ken and Sal do look up on the painting with differing views, however: Sal, the artist who draws and designs advertisements, suggests there ought to be some kind of meaning within Rothko’s work. Ken, however, says that the painting is an experience, one which the emotions of the viewer, whatever they are, are the only necessary response. The empathy elicited by a work within the field of cultural production is the goal. Empathy between creator and public, while seemingly intangible, which is to say lacking in economic evidence, is what work of art can provide via experience of it. Whatever the emotional response is, the creator’s desire to elicit response is what defines a work within the field of empathetic production. Because empathetic production has no direct connection to economic capital, meaning is sought to fill the gap— there must be some greater reason behind the existence of a work when its primary function is not to generate economic capital. Economic capital is seen as a desired outcome of any endeavor, not only because it is quantifiable but because it is exchangeable for items which promote a higher status quo. This, of course, leads into Weber and Protestantism, which will be another writing project for another time. Meanwhile, this meaning-making is not unfamiliar to those who teach creative writing, specifically poetry. There is the idea that a poem must reveal itself to the reader. This leads to a kind of riddle-poem, one which may be acceptably difficult so long as it ultimately produces an “ah ha” moment. This is the natural outgrowth, and part of the process, of a student’s development as a writer: as they move away from the immediately accessible, poetic-language based poems, they seek to obscure, to bury some kind of mystery that can be uncovered within their work. When I talk about language and “acceptable difficulty,” it comes with that understanding that language within a poem does not need to be simple— in fact, a non-poetry reading public expect difficult words in poems. People often expect the difficulty in poems to come from the language used but for that language to obfuscate a concept which ultimately must reveal itself in order for the reader to feel like a poem is worthwhile— worth the effort not only to read but produce. The production of a poem only seems worthwhile to a reader if it is ultimately comprehendible. Comprehension is key to the reader because the seemingly language-obfuscated message must ultimately be communicated. Meaning must be delivered. Let’s not kid ourselves: we are meaning-making machines. In virtually all aspects of life, we have sought, invented, and ascribed meaning because an acceptance of not knowing is seemingly dangerous and a challenge to know structural authority. Authority/patriarchy— these words and concepts require a kind of empirical knowledge, an ability to say, to utter with assuredness. In some ways, it seems we are programmed (enculturated?) against processing experience in the present and poetry can find a space here, a response and coagulation of experiences into text (or non-text, as the case may be). While this idea finds its opposition in Seth Abramson’s “first-responder” poetics, it does veer more towards the idea of poetry trying to boil a variety of ideas, experiences, and voices into one space. To return to Mad Men, I think Weiner has captured many of the ideas about art that interest me as well: by the end of the series, there are no great answers, either for the series or for Draper. Draper’s life is not significantly changed by the ending of the series and not necessarily any different than it was from the start. It is the journey of the character, internally, that is of interest. For Draper, it was about gaining a level of experience and understanding over his own mind (something he alludes to in season four with his own journal entries). Weiner, in the clip above, gives us a kind of primer to the series. 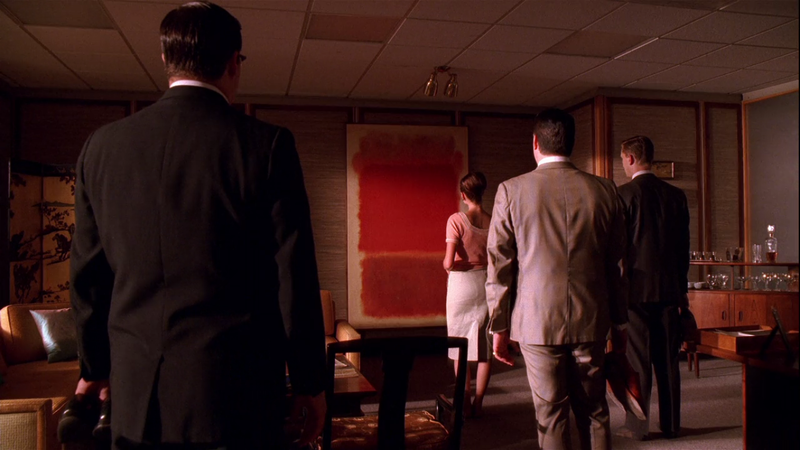 Ken and Sal’s discussion of Rothko is a discussion we could have about Mad Men and indeed ought have about several other forms of empathetic production. If you continue watching the clip shared above, you will note Cooper’s response to the painting: it is an investment, something which is not necessarily problematic, but which should increase in value during his ownership of it, allowing him to profit. This points to a very interesting idea behind the forms of capital generated by empathetic production, one which suggests that so long as someone is generating economic capital, even if it is not the creator of the work, then it is a worthwhile endeavor for viewer, owner, and creator. 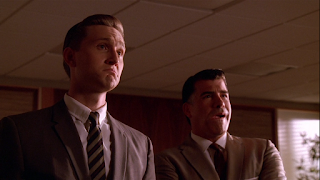 More on Mad Men‘s series finale and meaning-making.